, one of the greatest men of antiquity, was born most probably about the year B. C. 586, but this date has been much contested. 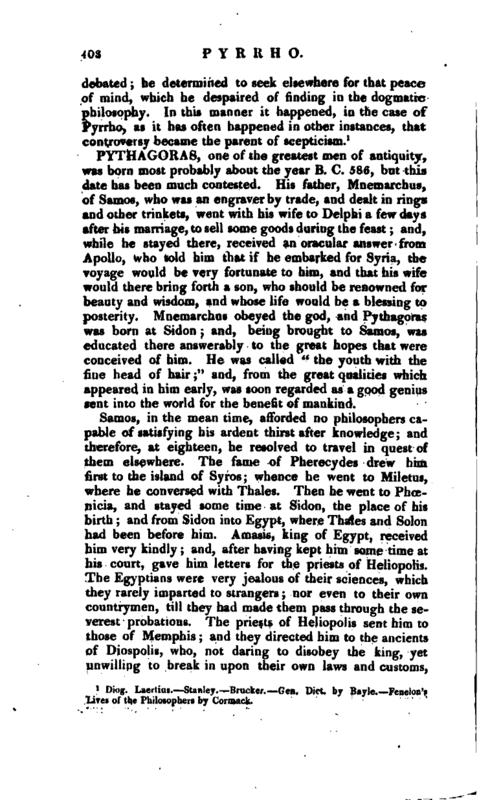 His father, Mnemarchus, of Samos, who was an engraver by trade, and dealt in rings and other trinkets, went with his wife to Delphi a few days after his marriage, to sell some goods during the feast and, while he stayed there, received an oracular answer from Apollo, who told him that if he embarked for Syria, the voyage would be very fortunate to him, and that his wife would there bring forth a son, who should be renowned for beauty and wisdom, and whose life would be a blessing to posterity. Mnemarchus obeyed the god, and Pythagoras was born at Sidon and, being brought to Samos, was educated there answerably to the great hopes that were conceived of him. He was called “the youth with the fine head of hair;” and, from the great qualities which appeared in him early, was soon regarded as a good genius sent into the world for the benefit of mankind. Samos, in the mean time, afforded no philosophers capable of satisfying his ardent thirst after knowledge; and therefore, at eighteen, he resolved to travel in quest of them elsewhere. The fame of Pherecydes drew him first to the island of Syros; whence he went to Miletus, where he conversed with Thales. Then he went to Phoenicia, and stayed some time at Sidon, the place of his birth and from Sidon into BJgypt, where Thales and Solon had been before him. Amasis, king of Egypt, received him very kindly and, after having kept him some time at his court, gave him letters for the priests of Heliopolis. The Egyptians were very jealous of their sciences, which they rarely imparted to strangers nor even to their own cpuntrymen, till they had made them pass through the severest probations. 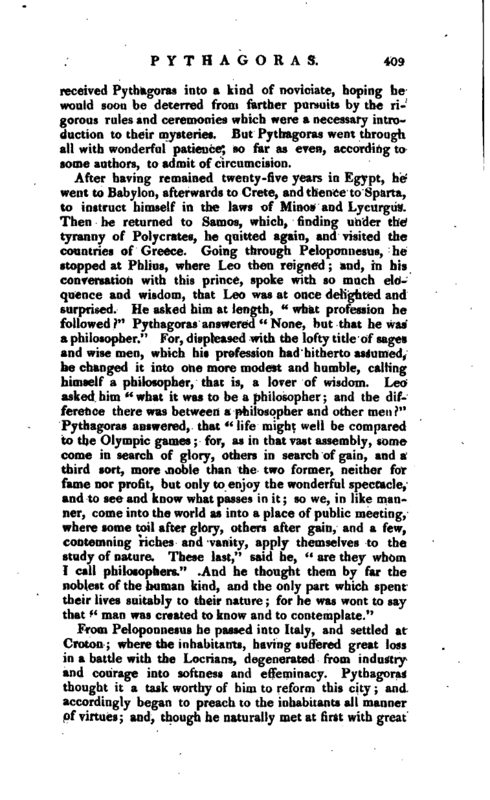 The priests of Heliopolis sent him to those of Memphis and they directed him to the ancients of Diospolis, who, not daring to disobey the king, yefc unwilling to break in upon their own laws and customs, | received Pythagoras into a kind of noviciate, hoping he would soon be deterred from farther pursuits by the rigorous rules and ceremonies which were a necessary introduction to their mysteries. But Pythagoras went through all with wonderful patience, so far as even, according to some authors, to admit of circumcision. every night, by sweet sounds. He likewise considared it as greatly conducive to health, and made use of it in disorders of the body, as well as in those of the mind. His biographers and secretaries even pretend to tell us what kind of music he applied upon these occasions. Grave and solemn, we may be certain; aud vocal, say they, was preferred to instrumental, and the lyre to the flute, not only for its decency and gravity, but because instruction could be conveyed to the mind, by means of articulation in singing, at the same time as the ear was delighted by sweet sounds. This was said to have been the opinion of Minerva. In very high antiquity mankind gave human wisdom to their gods, and afterwards took it from them, to bestow it on mortals. 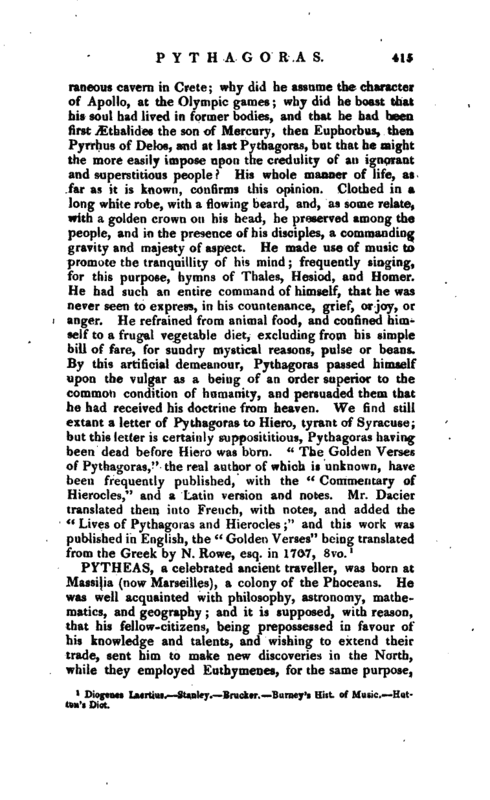 “In perusing the list of illustrious men, who have sprung from the school of Pythagoras, it appears that the love and cultivation of music was so much a part of their discipline, that almost every one of them left a treatise behind him upon the subject.” Dr. Burney, in Rees’s Cyclopædia. | The Egyptians believed the secrecy they observed to be recommended to them by the example of their gods, who would never be seen by mortals but through the obscurity of shadows. For this reason there was at Sais, a town of Egypt, a statue of Pallas, who was the same as Isis, with this inscription” I am whatever is, has been, or shall be; and no mortal has ever yet taken off the veil that covers me." They had invented, therefore, three ways of expressing their thoughts; the simple, the hieroglyphical, and the symbolical. In the simple they spoke plainly and intelligibly, as in common conversation; in the hieroglyphical they concealed their thoughts under certain images and characters; and in the symbolical they explained them by short expressions, which, under a sense plain and simple, included another wholly figurative. 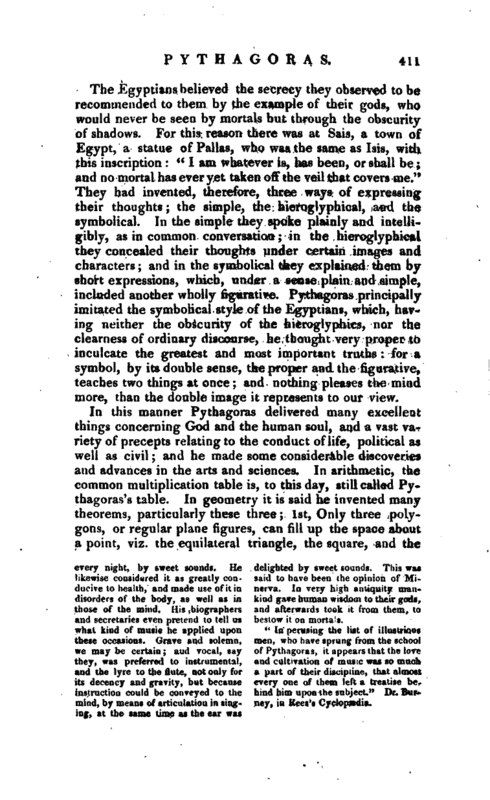 Pythagoras principally imitated the symbolical style of the Egyptians, which, having neither the obscurity of the hieroglyphics, nor the clearness of ordinary discourse, he thought very proper to inculcate the greatest and most important truths for a symbol, by its double sense, the proper and the figurative, teaches two things at once and nothing pleases the mind more, than the double image it represents to our view. In this manner Pythagoras delivered many excellent things concerning God and the human soul, and a vast variety of precepts relating to the conduct of life, political as well as civil; and he made some considerable discoveries and advances in the arts and sciences. In arithmetic, the common multiplication table is, to this day, still called Pythagoras’s table. In geometry it is said he invented many theorems, particularly these three; 1st, Only three polygons, or regular plane figures, can fill up the space about a point, viz. the equilateral triangle, the square, and the | hexagon: 2d, The sum of the three angles of every triangle is equal to two right angles: 3d, In any right-angled triangle, the square on the longest side is equal to both the squares on the two shorter sides: for the discovery of this last theorem, some authors say he offered to the gods a hecatomb, or a sacrifice of a hundred oxen; Plutarch, however, says it was only one ox, and even that is questioned by Cicero, as inconsistent with his doctrine, which forbade bloody sacrifices: the more accurate therefore say, he sacrificed an ox made of flour, or of clay; and Plutarch even doubts whether such sacrifice, whatever it was, was made for the said theorem, or for the area of the parabola, which it was said Pythagoras also found out. In astronomy his inventions were many and great. It is reported he discovered, or maintained the true system of the world, which places the sun in the centre, and makes all the planets revolve about him; from him it is to this day called the old or Pythagorean system; and is the same as that revived by Copernicus. 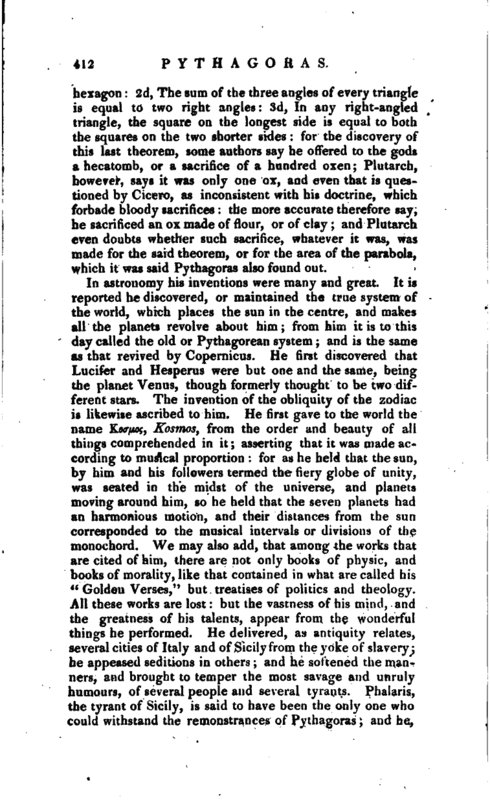 He first discovered that Lucifer and Hesperus were but one and the same, being the planet Venus, though formerly thought to be two different stars. The invention of the obliquity of the zodiac is likewise ascribed tt> him. He first gave to the world the name Kocr/xoj, Kosmos, from the order and beauty of all things comprehended in it asserting that it was made according to musical proportion for as he held that the sun, by him and his followers termed the fiery globe of unity, was seated in the midst of the universe, and planets moving around him, so he held that the seven planets had an harmonious motion, and their distances from the sun corresponded to the musical intervals or divisions of the monochord. We may also add, that among the works that are cited of him, there are not only books of physic, and books of morality, like that contained in what are called his “Golden VersesJ” but treatises of politics and theology. Ah these works are lost but the vastness of his mind, and the greatness of his talents, appear from the wonderful things he performed. He delivered, as antiquity relates, several cities of Italy and of Sicily from the yoke of slavery he appeased seditions in others and he softened the manners, and brought to temper the most savage and unruly humours, of several people and several tyrants. Phalaris, the tyrant of Sicily, is said to have been the only one who could withstand the remonstrances of Pythagoras and he, | it seems, was so enraged at his lectures, that he ordered him to he put to death. But though the reasonings ol the philosopher could make no impression on the tyrant, yet they were sufficient to revive the spirit of the Agrigentines, and Phalaris was killed the very same day that he had fixed for the death of Pythagoras. 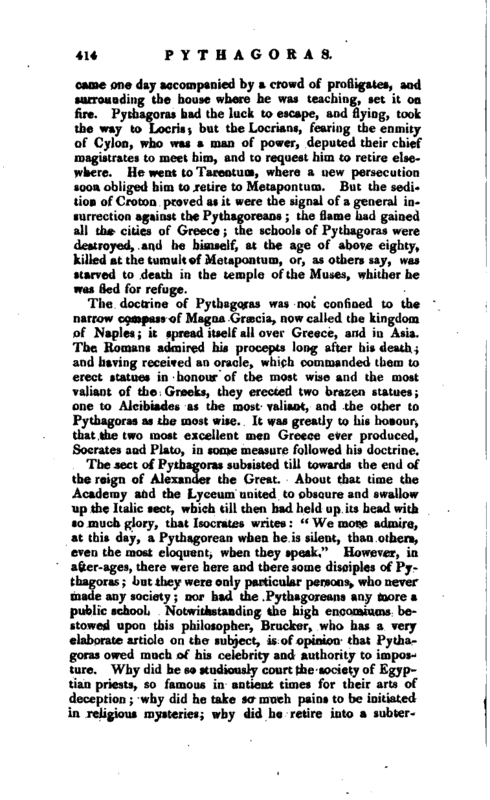 Pythagoras was persecuted in the last years of his life, and died a tragical death. There was at Croton a young man called Cylon, whom a noble birth and opulence had so puffed up with pride, that he thought he should do honour to Pythagoras in offering to be his disciple. The philosopher did not measure the merit of men by these exterior things; and therefore, finding in him much corruption and wickedness, refused to admit him. This extremely enraged Cylon, who sought nothing but revenge and, having rendered many persons disaffected to Pythagoras, | came one day accompanied by a crowd of profligates, and surrounding the house where he was teaching, set it on fire. Pythagoras had the luck to escape, and flying, took the way to Locrisj but the Locrians, fearing the enmity of Cylon, who was a man of power, deputed their chief magistrates to meet him, and to request him to retire elsewhere. He went to Tarentum, where a new persecution soon obliged him to retire to Metapontum. 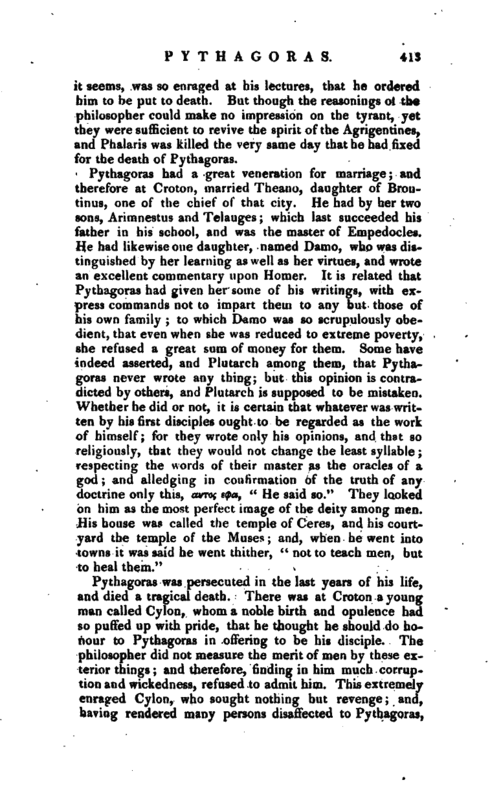 But the sedition of Croton proved as it were the signal of a general insurrection against the Pythagoreans the flame had gained all the cities of Greece the schools of Pythagoras were destroyed, and he himself, at the age of above eighty, killed at the tumult of Metapontum, or, as others say, was starved to death in the temple of the Muses, whither he was fled for refuge. The doctrine of Pythagoras was not confined to the narrow compass of Magna Grsecia, now called the kingdom of Naples it spread itself all over Greece, and in Asia. 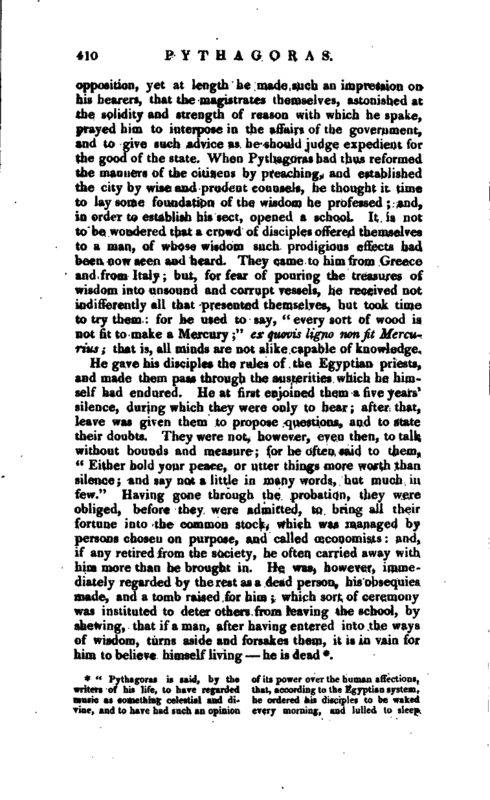 The Romans admired his procepts long after his death and having received an oracle, which commanded them to erect statues in honour of the most wise and the most valiant of the Greeks, they erected two brazen statues one to Alcibiades as the most valiant, and the other to Pythagoras as the most wise. It was greatly to his honour, that the two most excellent men Greece ever produced, Socrates and Plato, in some measure followed his doctrine. 1 Diogenes Laertius. Stanley. Brucker. Burney’s Hist, of Music, Huttow’s Dict.